"Alive 2007" is the magnum opus of this legendary dance act. 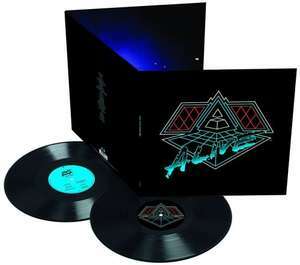 Featuring every major Daft Punk hit, it embodies the entire Daft Punk experience. While Homework and Discovery were important during their time, if you were to define Daft Punk by one release, you would choose this album. Easily one of the better works from this prestigious duo. It contains a flawless execution of house and memorable charm which was already present in the original songs. This is the perfect daily dose for you rave and techno/house lovers out there. Great price for 2 x 180g quality vinyl pressings. this really is a bargain. Awesome album and price. Bought this in 2007 and was blown away by it. Truly great album. So sorry I missed the tour! I bought this a few months back after reading a recommendation on here. Must have listened to it a hundred times since. Amazing album. Deal posting newbie! This is robbo145 first deal post. Help out by leaving a posting tip or just to show your appreciation for their contribution.